The flash estimate of 5.1% year-on-year growth in Q3 2018 surprised many analysts. With five consecutive quarters of growth over 5%, Poland’s run of strong macroeconomic results hasn’t yet run out of steam. It has just passed the peak of its current economic cycle, with annualised GDP growth now below its Q1 level of 5.2%. It is expected to slow down a touch more in Q4. A dynamic consumer sector and public sector-led infrastructure investment has kept growth above 5% as export-driven manufacturing slows. Growth into next year is expected to be somewhat slower than in 2017 and ‘18, with forecasts ranging between 3.6% and 4.2%. Construction has been leading the charge with a bounce-back to 22.4% growth in the year to October 2018 (compared to 16.4% in the year to September 2018); despite rising building-material prices and labour shortages, the boom goes on, driven by EU funds. Registered unemployment remains at 5.7%, at its record low in October 2018. Yet the Eurostat measure, looking at economic activity rather than the claimant rate, was 3.7% in October 2018, suggesting that over a third of those registered as unemployed are been working in the cash-in-hand sector. Overall, however, the number of Poles working informally has been shrinking, as legitimate employers have been forced to improve their offer to employees, reducing incentives to hide from the tax man. Concerted efforts by the Ministry of Finance to close down VAT loopholes (which resulted in 53.4 billion zlotys of foregone revenue in 2015) are proving effective. Deputy premier (now premier) Mateusz Morawiecki claimed to have clawed back some 15-17 billion złotys in 2016. This year will see a further tightening of measures against the grey economy, as micro-businesses are now obliged to file their VAT returns online in the Single Audit File for Tax (SAF-T) format. Voluntary split-payment of VAT was introduced on 1 July (for B2B transactions only), causing concern about the liquidity of small businesses whose cash-flow will be affected. And as of 1 October 2018, real-time reporting via online fiscal cash registers has become mandatory in the automotive service sector (garages, tyre fitters, car washes and indeed petrol stations); other sectors that have traditionally also avoided VAT such as hairdressers, beauty salons and nail bars will soon have to introduce fiscal cash-registers with online real time reporting; the process will continue into 2023 with the food retailing sector (largely well-behaved in the fiscal terms) being the last to have to comply. Concerns about the effects of political interference in the markets remain present among foreign investors. The law restricting Sunday trading, which comes in force in steps (from two Sundays a month in March 2018). In the pharmaceutical sector, there proposals to limit advertising and selling OTC remedies. The construction sector still has issues with ease of obtaining planning permissions and poor public procurement procedures. Remaining sectors of the economy, however, feel generally untroubled by political risk, and inward investment from the UK looks likely to rise as investors seek a high-skilled but lower-cost labour force within the EU. BPCC members in sectors such as HR and real estate report rising interest among UK-based businesses with US, Japanese or Indian capital looking for a secure base within the EU. Brexit-related worries are also prompting British businesses to consider Poland as a location for continental EU markets. Inbound foreign investment rose in 2017, according to the National Bank of Poland, continuing an upward trend visible since 2012. The two-and-half-year deflationary run that Poland has experienced since July 2014 came to an end, with consumer price inflation breaking into positive territory in December 2016, followed by a significant jump to 2.2% in February 2017, then holding around that level (1.8% in October '18). Wages, however, had been rising faster, with 7.6% growth in the private sector pay in the year to October. The 5.0% increase in the statutory minimum wage on 1 January 2018 (from 2,000 zł to 2,100 zł) has worked its way into the wage inflation figures. The Monetary Policy Council cycle of loosening money supply by lowering base rates from a high of 4.75% (May 2012) began in November-December 2012 and January-February 2013, with four consecutive 25 bp cuts, followed by a 50 bp cut in March 2013 and a further three 25bp cuts in May, June and July 2013, in response to weakening inflationary pressure. After three months of negative inflation, the MPC made a 50 bp cut in October 2014. The most recent cut was announced on 5 March 2015, and base rates have stayed at 1.5% since. Analysts are expecting an upward move, it may happen in spring 2019. During the four and half years from February 2004 to October 2008, registered unemployment in Poland fell faster than in any major economy ever in peacetime, from 20.4% to 8.8%. This level was unsurpassed until June 2016. The global financial crisis might not have pushed Poland into recession, but the economy certainly felt the strain. By March 2013, unemployment had reached 14.3%, a new high-water mark, before starting to fall, down to 5.7% in October 2018. 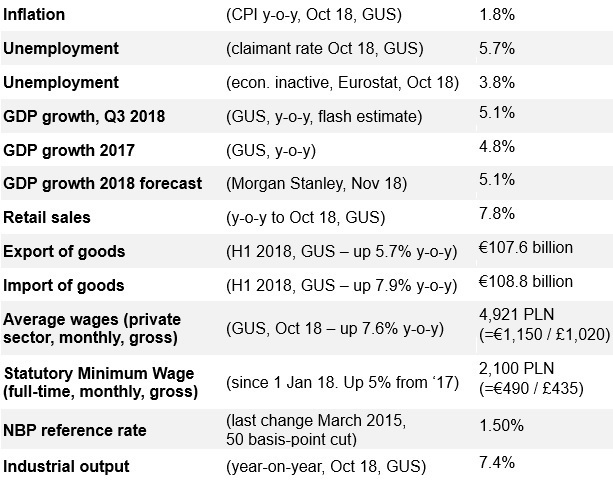 However, Eurostat says that Poland's unemployment, measured by economic activity rather than registered joblessness, stands at 3.7% (October 2018), suggesting that a third of those signed on are actually economically active working cash-in-hand within the grey sector. Eurostat's May 2018 figures marked the historic moment, when, on a like-for-like measure, unemployment in Poland actually fell below that in the UK. Compared to the situation in the UK, western Europe and the USA, Poland's unemployment is lowest in the cities and highest in rural areas, with more than half of the long-term unemployed living in villages. There remain massive regional disparities between cities where unemployment is very low (Poznań 1.2%, Warsaw 1.5%, Katowice 1.7%, Wrocław 1.8%, Kraków 2.5%, Gdansk 2.6% in October 2018) while in many small provincial towns it remains stubbornly in double digits. Szydłowiec, some 120km south of Warsaw, also in the Mazowsze province, holds the record at 23.1.%. Nearby Radom, a city of 200,000 people, also has high unemployment at 11.8%. Fruit-growing Grójec poviat south of Warsaw has just 1.9% unemployment, reflecting the difficulties that employers have in finding fruit pickers. Regional differences in unemployment will play in important role in the government's new industrial strategy, in which investment will be directed by subsidies and tax incentives towards areas of higher unemployment. Investors might wish to consider university cities such as Kielce, Lublin or Łódź, where unemployment is 5.2%, 5.5% and 5.6% respectively (data from October 2018).